A rain garden slows the flow of rainwater runoff by using elements similar to those that occur in nature: plants, stone, shallow swales and depressions that catch and hold rainwater rather than let it run off unhindered. Plants that offer a diversity of both deep and fibrous root systems help make the soil more permeable, sponge-like and able to absorb a large amount of rainfall. Native plants are typically preferred due to their hardy nature. Water gathers temporarily in shallow depressions and is absorbed by the soil and plants as well as being filtered as it percolates through the soil horizon. A homeowner who plans to install a rain garden where no development or redevelopment is taking place may prefer this low cost option. Soil pore space is gradually improved over time through the combined interactions of added well-aged compost, mulch, microbes, and deep rooted plants. Plants that are able to tolerate primarily moist (and sometimes dry) soils thrive best in these environments. A rain garden is not necessarily the right solution for your site. For detailed guidance on where and how to install a native soil rain garden, as well as recommended alternatives to rain gardens under certain conditions, see How to RainScape. 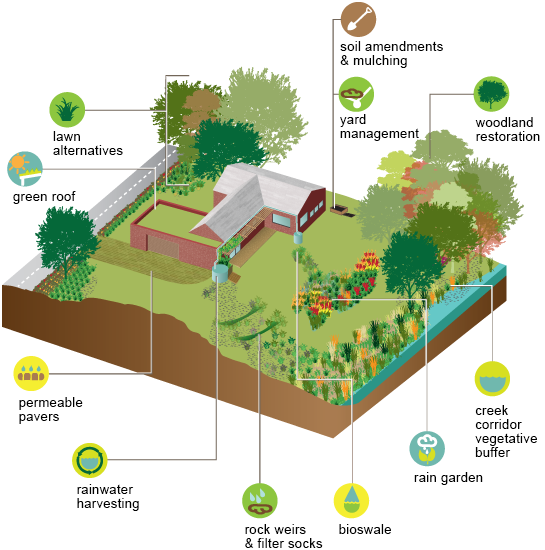 For a comprehensive overview of rain garden design using an intuitive visual interface, check out this interactive graphic from the University of Nebraska–Extension. Where development or redevelopment is occurring engineered bioretention may be specified. The commercially designed rain garden requires the removal of existing soil and replacement with a 60–80 percent sandy soil mix, typically along with a piped underdrain. Plants that are able to tolerate primarily dry (and sometimes wet) soils thrive best in these environments. For more information on how to design an engineered bioretention system download the MSD Landscape Guide for Stormwater Best Management Practices [pdf].